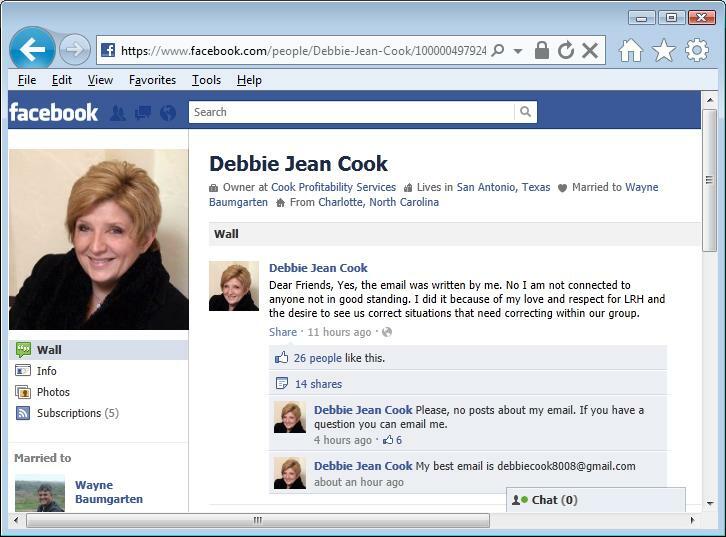 January 1, 2012 -- DEBBIE COOK SPEAKS OUT. 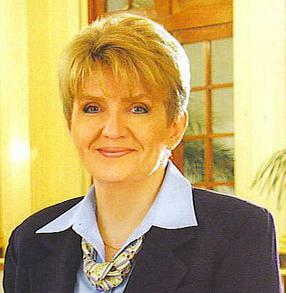 Debbie Cook is the former Captain of the Church of Scientology's Flag Service Org -- the most senior position at what is commonly called "Flag" or the "Church's spiritual headquarters". At the time of writing, she is a member in good standing of the Church of Scientology. She had been in the Sea Org for 29 years, and held her leadership position at Flag for 17 years. In 2007, she had routed out (i.e. properly left) the Sea Org, allowing her to remain in good standing with the Church since that time. Today, however, thousands of Scientologists received the below email from her in their email boxes. The next few weeks and months will indeed be interesting, as we see how the Church responds to her attempt to "affect a change in serious off policy actions occurring". The extreme over-regging and fund-raising activities that have become so much a part of nearly every Sea Org org and Class V org as well as every ?OT Committee? is not covered anywhere in LRH policy. Hardworking Sea Org members and the dedicated staff of orgs around the world aren?t choosing to do these actions. Nor are the OTs. I am sure they would be more than happy if they could just get on with direct dissemination of Scientology as they have done for so many years. LRH lists there the INTERNATIONAL ANNUAL MEMBERSHIP and gives its cost at 10 pounds sterling or $30 US. He also lists a LIFETIME MEMBERSHIP which is priced at $75 US. There are no other memberships or statuses approved or known to LRH. Furthermore, membership monies are supposed to go directly to the org where the membership is signed up, and the money used for dissemination by that org, in that area. This is covered in HCOPL 1 Sept 1965R Membership Policies. Currently membership monies are held as Int reserves and have grown to well in excess of a billion dollars. Only a tiny fraction has ever been spent, in violation of the policy above. Only the interest earned from the holdings have been used very sparingly to fund projects through grants. In fact many of the activities you see at IAS events are not actually funded by the IAS, but rather by the Scientologists involved. Think about it, how many ads disseminating Scientology, Dianetics or any Scn affiliated programs have you seen on TV? Heard on the radio? Seen in newspapers? I haven?t seen one in the 4 years I have lived in San Antonio, Texas, the 7th largest city in the US. How many have you seen? Donating anything more than a lifetime membership to the IAS is not based on LRH policy. The article ?What Your Donations Buy? (The Auditor, The Monthly Journal of Scientology No. 51, 1970) is clearly talking about how the church uses your donations for Dianetics and Scientology services. Next time you are asked to donate outside of services, realize that you are engaged in fundraising and ask to see something in writing from L. Ron Hubbard that this is something he expects from you as a Scientologist. New Org Buildings: LRH also never directed the purchase of opulent buildings or the posh renovations or furnishings for every org.In fact, if you read HCO PL 12 March 75 Issue II, ?The Ideal Org?, which is what this program has been called, and nowhere in it will you find 20 million dollar buildings or even any reference to the poshness of org premises at all as part of LRH?s description of an ?Ideal Org?. Instead, an Ideal Org was one that delivered and moved people up The Bridge ? something that is not part of this ?Ideal Org? program. LRH says in the PL that an Ideal Org: ?would be clean and attractive enough not to repel its public? ? LRH. This is all it says about the state of the building. As a result of this off-policy alteration of the Ideal Org PL, we have the majority of top OTs, now deemed ?OT Ambassadors?, heavily engaged in fund-raising activities that include ?bingo?, ?pirate dinners?, ?knitting classes?, ?hay rides?, and many other activities strictly revolving around raising funds for the required multi-millions of dollars to fund their ?Ideal Org?. As part of this, people around every org are now asked to donate to their local ?Ideal Org? instead of their own services or their own Bridge. LRH says in HCO PL Org Ethics and Tech: ?GET RID OF DISTRACTIONS FROM SCIENTOLOGY in your org. Baby-sitting or raffle tickets and such nonsense.? Yet these distractions are rampant as they are being used as fund-raisers to get money for the huge quotas being issued to fund the ?Ideal Org?. "If the org slumps... don't engage in 'fund-raising' or 'selling postcards' or borrowing money. It's a sign of very poor management to seek extraordinary solutions for finance outside Scientology. It has always failed." ?For orgs as for pcs, 'Solve It With Scientology'. "Every time I myself have sought to solve financial or personnel in other ways than Scientology I have lost out. So I can tell you from experience that org solvency lies in more Scientology, not patented combs or fund-raising barbeques." The point is that Scientologists and OT's need to be training, auditing and disseminating to raw public - not regging each other or holding internal fundraisers. Out Tech: Over the last few years we have seen literally hundreds and hundreds of people who were validated as clear using the CCRD as developed by LRH now being told they are not Clear. This included hundreds of OTs who were then put onto NED as a "handling". LRH clearly forbid any Dianetics to be run on OTs in HCOB ?Dianetics Forbidden on OTs?. This is out tech. This entire technical ?handling? was directed personally by COB RTC and was done on thousands of OTs. But it was based not on an LRH HCO Bulletin, but rather based on a single C/S instruction where LRH C/Sed one pre-OT who had not achieved the state of clear but was mid OT III and not making it. LRH directed a solo handling that the pre-OT was to do to get himself to achieve the state of Clear. This LRH C/S taken out of context was then used to implement a technical handling that was in direct violation of an LRH HCOB. This and other ?technical handlings? done on Solo NOTs auditors created great expense and hardship on Solo NOTs auditors around the world as they were made to do these handlings to continue on the level. Then there are the ?fast grades at Flag? that no other org has. How can it be that Flag has been delivering grades differently to the rest of the world for the last 3 years? Whatever the problem is, the fact is that having ?fast Grades? at Flag creates a hidden data line and is a HIGH CRIME and the subject of an entire policy letter called "TECH DEGRADES" which LRH has placed at the start of every Scientology course. More recently the fad seems to be that nearly everyone needs to ?re-do their Purif and do a long objectives program?, including many OTs mid Solo NOTs. There is nothing wrong with doing objectives, but it is a clear violation of HCOB 'MIXING RUNDOWNS AND REPAIRS" to have a person mid a rundown or OT level be taken off it and placed on an objectives program. I myself was subject to these out tech ?handlings?, including extensive FPRD mid Solo NOTs. It took its toll in many ways, including physical situations I am still dealing with today. So I have some reality of the hardship caused. LRH Command Structure: LRH left us with a complex and balanced command structure, with our orgs led by the Office of ED International. This office was considered so important that LRH created a special management group called the Watch Dog Committee whose only purpose was to see that this office and the other needed layers of management existed. LRH ED 339R speaks of this extensively as the protection for our Church. But these people are missing. And not just some. As of just a few years ago there were no members of the office of ED Int on post, not to mention top execs throughout the International Management structure. You may have also wondered? where is Heber, the President of the Church? What about Ray Mitthoff, Senior C/S International, the one that LRH personally turned over the upper OT Levels to? How about Norman Starkey, LRH?s Trustee? What happened to Guillaume ? Executive Director International? And Marc Yeager, the WDC Chairman? What happened to the other International Management executives that you have seen at events over the years? The truth is that I spent weeks working in the empty International Management building at Int. Empty because everyone had been removed from post. When I first went up lines I was briefed extensively by David Miscavige about how bad all of them were and how they had done many things that were all very discreditable. This seemed to ?explain? the fact that the entirety of the Watchdog Committee no longer existed. The entirety of the Executive Strata, which consisted of ED International and 11 other top International executives that were the top executives in their particular fields, no longer existed. That the Commodore?s Messenger Org International no longer existed. All of these key command structures of Scientology International, put there by LRH, had been removed. There were hundreds and hundreds of unanswered letters and requests for help from org staff, written based on LRH ED 339R where LRH says that staff can write to these top executives in the Exec Strata for help. But this is not possible if all these execs have been removed and no one is there to help them or to get evaluations and programming done to expand Scientology. Well, after that I got to spend some quality time with Heber, Ray Mithoff, Norman Starkey, Guillaume, as well as the entirety of International Management at the time, who were all off post and doing very long and harsh ethics programs. These have gone on for years and to the only result of that they are still off post. There is no denying that these top executives have all gradually disappeared from the scene. You don?t see them at the big events anymore or on the ship at Maiden Voyage. David Miscavige has now become the ?leader? of the Scientology religion. Yet what LRH left behind was a huge structure to properly manage all aspects of the Scientology religion. He put a complete and brilliant organizational structure there, not one individual. There never was supposed to be a ?leader? other than LRH himself as the goal maker for our group. There is a situation here and even if you have not been to the International Management Base you should be able to see that over regging and frequent tech changes are not OK and you have a responsibility to do something to Keep Scientology Working. You should be able to find and read the references on membership in OEC Volume 6. Find and read the HCO PL entitled ?The Ideal Org? (Data Series 40). Find and read the references on org buildings, including HCO PL 24 Aug 65 II, "Cleanliness of Quarters and Staff, Improve our Image". Also, HCO PL 17 June 69, "The Org Image". If you don?t want to make waves or put yourself in danger of being taken off the level or denied eligibility, then there are some simple things you can do. First and foremost, withdraw your support from off policy actions. Stop donating to anything other than your own services and actual Bridge progress. Simply demand to see an LRH reference that says you are required to make other such donations. No one will be able to produce any references because there aren?t any. LRH says what he expects of a Scientologist ? that is what he expects you to do. In fact he put it in HCOB 10 June 1960 Issue I, "Keeping Scientology Working Series 33, WHAT WE EXPECT OF A SCIENTOLOGIST". Read it and follow it. Please keep this email among us, the Scientologists. The media have no place in this. You may wonder why I have not written a KR and gone about my business. The answer is, I have. But there is no longer anyone to send that KR to. The truth is that as a Scientologist you are more able, more perceptive and have a higher integrity. Scientology is supposed to make you ?think for yourself? and never compromise your own integrity. And most certainly LRH held every Scientologist responsible to KEEP SCIENTOLOGY WORKING. I am not trying to do anything other than affect a change in serious off policy actions occurring. My husband and I have most of our family and many many good friends who are Scientologists. I have not been real interested in sticking my neck out like this. However, I also know that I dedicated my entire adult life to supporting LRH and the application of LRH technology and if I ever had to look LRH in the eye I wouldn?t be able to say I did everything I could to Keep Scientology Working if I didn?t do something about it now. We all have a stake in this. It is simply not possible to read the LRH references and not see the alterations and violations that are currently occurring. You have a very simple obligation to LRH. Don?t participate in anything off policy, and let others know they should not either. If every person who reads this email does nothing more than step back from off-policy actions we would have changed direction. If we took all that energy and directed it into auditing, training and raw public dissemination, we would be winning. In earlier months, others had given a much more detailed account of what happened while Debbie was in her final months in the Sea Org here, here, here and here. Having exposed the abuses of David Miscavige for the world to see, in April 2012, Debbie and her husband decided to settle with the Church of Scientology. An article on the settlement can be found here.